Kendall™ Cohesive Bandages maintain consistent compression with non-slip support and is an excellent pressure bandage without cutting off circulation. Kendall Cohesive bandages are self adherent and require no pins, clips or tape. They are adhesive-free and will not stick to hair or skin and leave no residue. The bandage is soft, non-constricting, safe, will not slip and are easy to work with. They are also breathable and provide aeration, stays cool, and provides patient comfort. 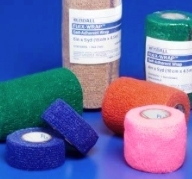 Kendall Cohesive Bandages are for use as a compression dressing, over-wrap for Unna Boot, wrapping splints / arm boards, post-op wraps, and securing IV or other devices. Works better than other alternatives. In combination with gauze, provides better than paper, silk or adhesive tape. Came quickly . Color as ordered. Great quality. No complaints. This product prevents pulling sticky bandages off of tender skin. The kids love it.